Dashiell Hammett is best known for writing The Maltese Falcon and The Thin Man, and creating the iconic private eye Sam Spade. His no nonsense crime writing will never be forgotten but Hammett, who died 50 years ago this week, led a fascinating life of drama and intrigue. Born Samuel Dashiell Hammett in 1894, Hammett received little formal education and dropped out of school at age 13. He tried his hand at a wide variety of work, including newsboy, stevedore, laborer and more, before joining the Pinkerton National Detective Agency when he was 21. Hammett worked for Pinkertons intermittently as an agent until he was 28, but took a hiatus after enlisting in the U.S. army during World War I as a sergeant in the ambulance corps. There was a worldwide Spanish Influenza epidemic at the time, and Hammett contracted it almost immediately, then caught tuberculosis, and spent much of the war in a hospital in Washington State. It was there that he met his eventual wife, a nurse named Josephine Dolan. But the marriage lasted less than a decade as Hammett's persistent tuberculosis and the risk of infecting his children prevented him from living with his family. Hammett’s writing career began with short stories penned in his spare time, mostly inspired by his experiences with private investigation. He also earned some income writing ad copy for a San Francisco-area jewelry store as well as reviewing books. He was first published in 1922 in a periodical called The Smart Set. But his break came a year later when a short story was published in Black Mask Magazine. 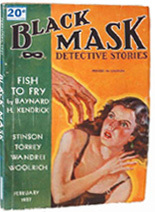 He became a regular contributor to Black Mask and was soon one of their most popular writers, along with fellow mystery authors Erle Stanley Gardner and Raymond Chandler. One of his best loved characters, The Continental Op, appeared in 34 short stories in Black Mask. He wrote five novels - Red Harvest, (1929), The Dain Curse (1929), The Maltese Falcon (1930), The Glass Key (1931) and The Thin Man (1934). Despite tuberculosis and ill health, Hammett re-enlisted in the army in 1942 and used favors and influence to be admitted. He worked as an army newspaper editor in the Aleutian Islands but could add emphysema to his list of ailments by the end of the conflict. His health never fully recovered. Poor health did not prevent Hammett from becoming deeply entrenched in political activity. In the 1930s, when not writing or delving into investigative intrigue, Hammett spend much of his time involved in the anti-fascist movement. Devout in his beliefs, part of the reason for Hammett's separation from the Pinkerton Agency was his disapproval of the agency's anti-union stance. Hammett's beliefs, vocal denunciation of Nazism, membership of the Communist Party and eventual role as vice-chairman of the deemed-subversive Civil Rights Congress (CRC) was noticed by the authorities. In the late 1940s and early ‘50s, his activities were highlighted as ‘un-American’ under Senator Joseph McCarthy's reign of anti-communist hysteria. In 1951, the author was imprisoned on contempt charges for six months after he refused to testify against four fellow communists in a conspiracy trial for whom the CRC had posted bail. Even after his release from prison, life for Hammett was not rosy – the powers-that-be saw to it that his Sam Spade radio series was cancelled, and the I.R.S. came after him for $100,000 in back taxes. In 1953, McCarthy’s interest turned to banning pro-Communist books. Hammett’s work was branded subversive and recommended for suppression. With his affluence and health behind him, Hammett continued to write, often in solitude, but occasionally spending time with his longtime friend and lover Lillian Hellman, upon whom the character of Nora Charles, from The Thin Man, was based. He died in New York on January 10, 1961 and is buried in the Arlington National Cemetery near Washington DC. Red Scare or Red Menace?